Known for his vocals on VaalSow's hit track “Hade Mabebeza”, Earl W. Green is no stranger to the house music scene who has just released his debut album on which he explores numerous sub-genres of deep house. V.Underground has been part of the Soul Candi family since finishing high school, having studied and worked at the Soul Candi Institute of Music as well as Soul Candi Studios as sound engineer and in-house producer. Since then he has gone on to work with prominent names in the local industry such as RJ Benjamin and Shimza as well as producing remixes for the likes Nastee Nev, Kid Fonque and Infinite Boys. 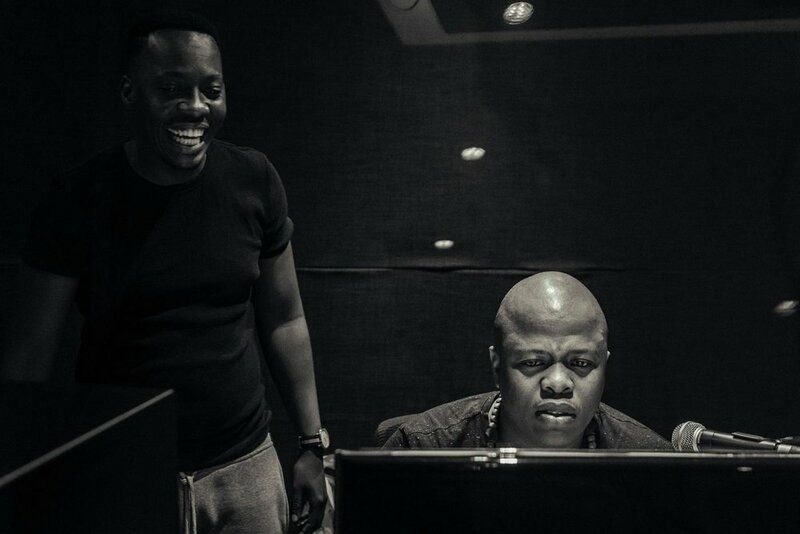 Frequent collaborators, the two visited Red Bull Studios Cape Town to work on a new single. We caught up with them to find out a little bit of their backstory. How did the two of you meet and decide to work on this project? Earl: How it happened is that we live in the same neighbourhood, Bedworth Park in Vereeniging. He studied at Soul Candi Institute of Music and I was studying at Damelin Braamfontein and I needed software, I think it was Cubase. A friend of mine who was actually a radio DJ at the local university said “I know someone who’s got software and he works at Soul Candi”. I was like, “really? In this town there’s someone at Soul Candi! ?” We drove to his place and when we got there my friend Thabo introduced me to him. From then on we started working together and became friends. That’s when we started working on projects like Candi Roots Volume 2, we did about six tracks on that. We’ve done a lot of international remixes as well. We’ve done a lot of projects that a lot of people do not know in the front of stage. That it is V and Earl who have worked on these tracks. We like to gel together. There’s magic that happens because I’ll be on the keys and the vocals and melodies and he gives me basslines and whatever he can give me to play. We just make a dynamic duo. How did you start singing Earl? Was it something you always did as a kid? Earl: I always liked Michael Jackson’s music. My dad was actually a DJ so he always bought records and vinyls back in the day. He bought records like Stevie Wonder, Whitney Houston, Michael Jackson, Shalamar, Donnie Hathaway, Sam Cook. So I’ve got a very rich history of soul music, American based. Obviously he’d get some South African stuff as well like Miriam Makeba, he’d have some jazz as well, Thelonious Monk. So my ears were trained in that way. I grew up listening to the music. The whole Motown era as well. The Temptations, the Commodores. It was sort of like a black culture thing that you grow up listening to those kind of tracks that are soulful and are American. So that’s where most of my influences lie. South African as well. Caiphus Semenya, Letta Mbulu, Sankomota. So very diverse musical background. I started singing gospel when I grew up. I think I was about 16 when I joined the church choir. As time went on I found out that I really love singing and decided to pursue it as a career. I never really studied vocal lessons. I attended the FUBA School of Arts, which is the Federated Union of Black Artists and there I studied jazz piano. So I’m a jazz pianist by profession! But the vocal thing is something that I could do, so I thought I don’t really have to go to school for it. So I’m self-taught when it comes to that. You’re from the Soul Candi family V. How did you get your start with them? V.Underground: After high school I decided I didn’t want to do anything besides music so I went to the Soul Candi Institute of Music. Studied music production and sound engineering. In the middle of my course, because what they saw was that I was always trying to improve myself. Always in studio, I would miss classes as well. Everything they did in class, I’d go home and revise it myself and then be in studio not in class. When I went to classes it was because I couldn’t understand a few things. From there Ryan Murgatroyd wanted me to be an intern lecturer. So I started lecturing in the middle of my course! I lectured there for two years. From there it was the same thing, after class I’d go to studio and do all the things. When Joao from Mi Casa was still Joao, Sergio came with him to studio and we worked on something and Sergio decided I should work at the Soul Candi Studios as a sound engineer. So I went there as a sound engineer and in-house producer. I worked first as an engineer. So I used to do engineering for a lot of guys. RJ Benjamin, Mi Casa, a lot of people. Fixing, mixing and mastering. I also was an in-house producer so I would produce songs for people as well and produce songs for me as well and I would release those songs through Soul Candi until they decided they want me to be an artist and release music through them. That’s when I released Candi Roots, it was a 12 track EP and a 3 pack CD. It did very well because one of the tracks ‘Gelo Wandi’ was nominated for the SAMA’s. So that’s the path. What are the tracks you’re working on about? V.Underground: Yeah we’re doing two tracks. Initially it was a track called ‘Desire’, but we decided to work on a track called ‘Rollercoaster’ because of what he [Earl] was going through. Earl: Relationship wise, it’s about a special somebody and I always feel that our relationship is crazy dynamic. One day we’re happy in love, it’s all lovey-dovey and the next we’re fighting, grabbing each other. It’s normal with most couples, you fight, you love, you make up. So it’s a rollercoaster ride. That’s where the concept comes from. V.Underground: For me I’m doing one track with Earl which is called ‘Smandana Boda’. He doesn’t like the track. When he played songs from the album he was doing he’d always play a different song. I know I have an ear for hits. And I said that song is nice and he was like “maybe, I don’t know”. We decided we’re going to take the same track and revamp it. So that’s coming out. I’m doing a track with Jay Patrick, a guy from Nigeria. I’m doing a project with N'dinga Gaba, a two track EP. Basically for me, from next year that’s what’s coming. After that we’re going to do a project together as well, a five track EP. E: There’s no telling what we’re really going to do in terms of sounds. We experiment with everything. Right now we’re thinking of exploring the tech scene. Deep tech is something that is very worldly appreciated, especially in Europe. We started to realise that the music we make is actually beyond the borders of South Africa or Africa. It’s worldwide.